Fall is in the air and I am having a blast experimenting with all the different types of seasonal squash I’ve been getting in my produce boxes. I will admit this was my first time cooking an acorn squash. When I was looking at recipes it seemed like most people douse them with sugar and butter and bake them. I was looking for a healthier approach since I’m trying to watch my carbs, I know, I’m boring. 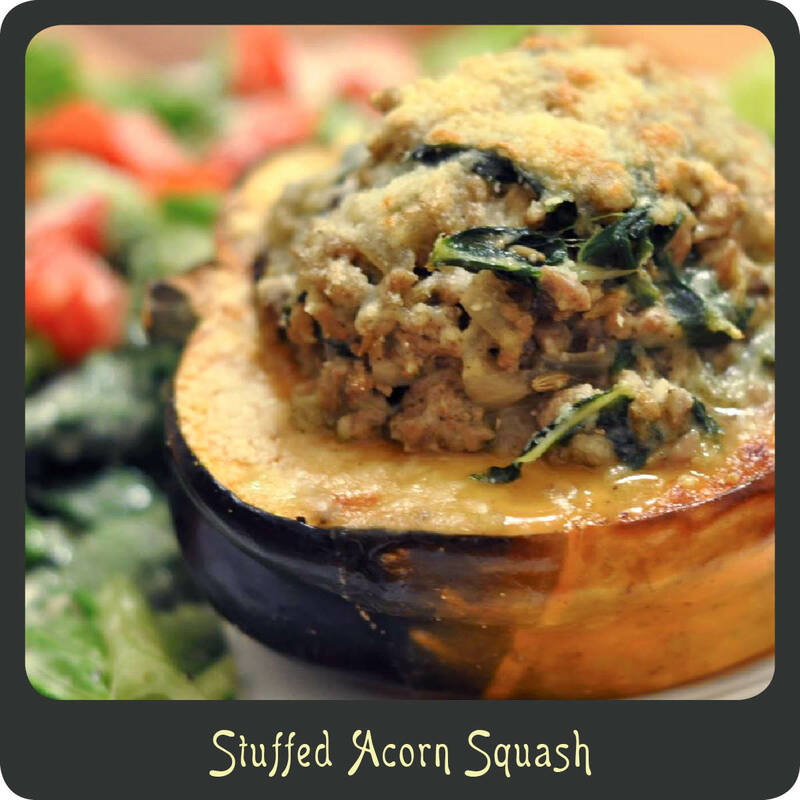 I found several stuffed squash recipes so I took bits and pieces from many of them and came up with this. It made for a delicious fall dinner and it’s fun because the squash itself is an edible bowl. The filling is packed with all sorts of veggies and I used extra lean ground turkey making it low cal. Don’t worry I added cheese to help balance that out. For a healthy dinner option this certainly wasn’t short on flavor. Give it a try! Season the squash halves with salt and pepper. Place halves on a baking sheet cut side up and cook for 1 hour. When the squash have 30 minutes of cook time remaining start your stuffing. Heat oil in a large skillet or wok over medium-high heat. Add mushrooms, onions, and garlic to the pan and cook until softened. Add the ground turkey and cook for about 10 minutes making sure to break it up into crumbles. Stir in all of your seasonings and add in the chard. Cook stuffing mixture for another 10 minutes. Add in broth and panko and cook at a simmer until all the liquid is absorbed. When the squash is done it should be easily pierced with a fork. Remove squash from the oven and spoon your stuffing mixture into each half. Top each with parmesan cheese and place under the broiler for 5 minutes until cheese is a nice golden brown.